What is Online Job Description Software? Job Description Software allows you to create, manage and store your job descriptions. With Job Description Software you will be able to configure custom description templates to use as and when you need them. This will save a lot of time and money as you will be able to easily create consistent detailed job descriptions at the click of a button. CompetencyCore is the leading competency-based job description software to help HR professionals, select, develop & retain their top talent. 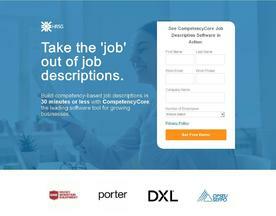 See how CompetencyCore can help you quickly create effective, high-quality and S.M.A.R.T job descriptions today.